Winter is passing by slowly and spring gets in its place. This is a very interesting time of the year, not only because of the awakening of the nature, but also from a culinary point of view. At this time of year, both winter-stored and fresh spring versions of the same ingredients can be found at local markets. While the winter vegetables usually require a lot more cooking time, spring vegetables tend to get soft within minutes. In this dish I combined the last purple carrots from winter with the first orange ones of spring. 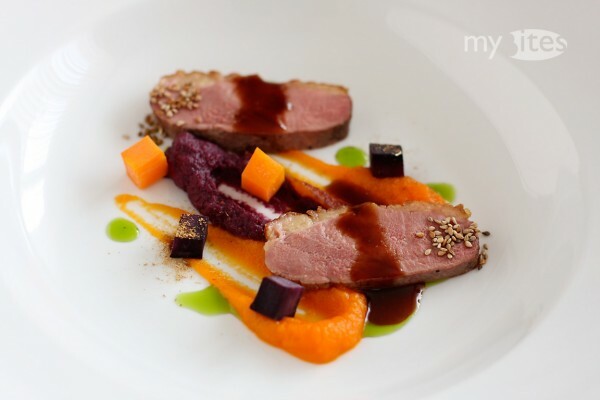 This entry was posted in Main Course, Poultry and tagged basil, basil oil, carrot puree, cep, duck breast, mushroom, orange carrot, porcini, poultry, purple carrot, sauce, sesame on March 19, 2012 by Robert.